RadDocument is the root element for RadRichTextBox's content. 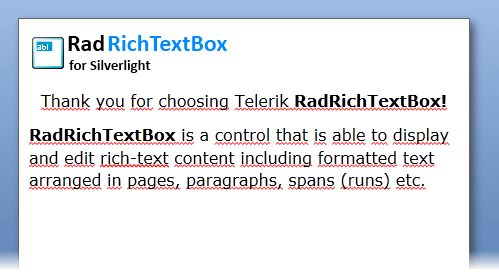 It holds the collection of Sections defined for the RadRichTextBox content. It also enables you to configure the appearance of its child elements. This article explains how you can customize the contents of RadDocument. LayoutMode: Specifies whether the page should be in Paged, Flow or FlowNoWrap layout mode. To learn more about layout modes, read here. SectionDefaultPageSize: This property is of type Size and represents the default page size of the document. Example 1 shows how to use it. The SectionDefault~ settings get applied only when Paged layout mode is used. SectionDefaultPageMargin: Defines the default margin for each of the sections in the RadDocument. To assign different margins for each of the sections, use the respective property of the Section class. SectionDefaultPageOrientation: Defines the default section page orientation. This property is of type PageOrientation and could be set to Portrait or Landscape. ParagraphDefaultSpacingAfter: Defines the default spacing after for each of the paragraphs in the RadDocument. To assign different spacing after each of the paragraphs, use the respective property of the Paragraph class. ParagraphDefaultSpacingBefore: Defines the default spacing before for each of the paragraphs in the RadDocument. To assign different spacing before each of the paragraphs, use the respective property of the Paragraph class. LineSpacing: Specifies the value for the space between the lines. AtLeast: The space between the lines should be equal to or greater than the value of the LineSpacing property. Auto: The space between the lines is determined automatically. Exact: The space between the lines should equal the value of the LineSpacing property. ShowFormattingSymbols: Indicates whether the formatting symbols should be displayed or not. DefaultTabWidth: Specifies the default tab width of the document. RadDocument exposes also the IsEmpty property allowing you to determine whether the document instance has any content. The first time a RadDocument is shown inside a RadRichTextBox in the Visual Tree, it is measured by the framework and arranges its children. This is the moment when the layout cycle is completed; each of the document elements calculates its size and arranges its children. For example, you can build a RadDocument from scratch and add Sections to it as demonstrated in Example 2. You can also merge RadDocument instances. For more information, see the Merge Documents section. Splitting an already measured document into two sections at the current caret position, on the other hand, can be done by inserting a section break. More details about the Section element and the section break types is available here. The whole hierarchy of the document elements can be found here. Example 4 shows a sample code that creates a new RadDocument instance and assigns it to RadRichTextBox. This document is editable. To make it read only you have to set the IsReadOnly property of the RadRichTextBox to True. To learn more about the read-only feature, read this topic.